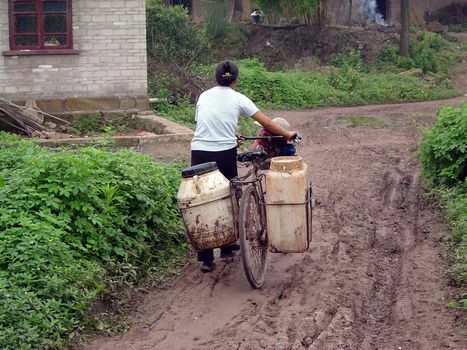 The Red Basin of Sichuan, an ancient lakebed, was historically the largest block of irrigated land in China. 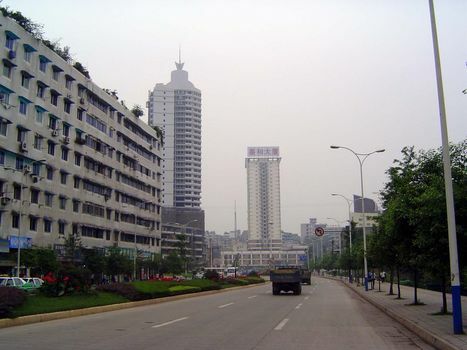 Here, at about the halfway point on the Chengyu expressway that connects Chengdu to Chongqing, we get off at the city of Nei Jiang and find our way outside the city to find some Sichuan countryside. 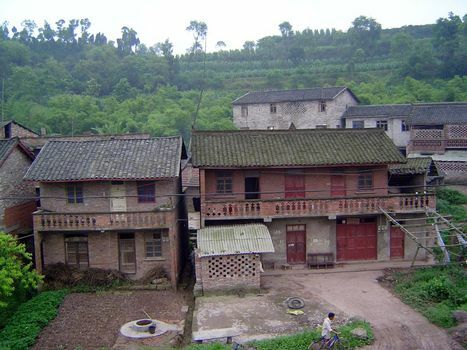 Not what you expect for a town you never heard of in the middle of "rural" China? 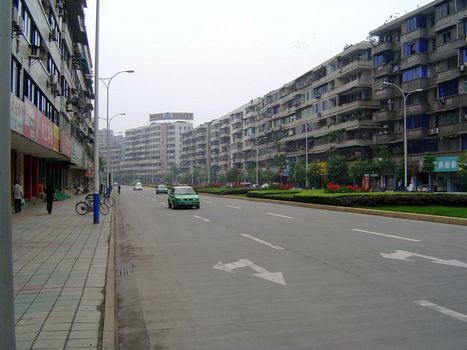 Nei Jiang has 300,000 people. We've travelled no more than three miles from the last picture. Home? Office? Stove fuel is bundled below. Let's check the signs. Quite an assortment. 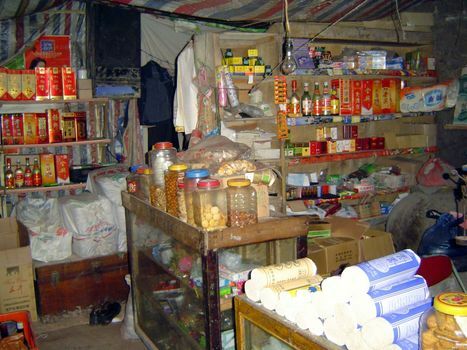 The red one on the left says: "May your wishes come true as you welcome the [Chinese] New Year." The red signs around the door say: "March to a Prosperous Society in Good Times," "Ease Farmers' Burden," and "Reduce Agriculture Tax Rate." 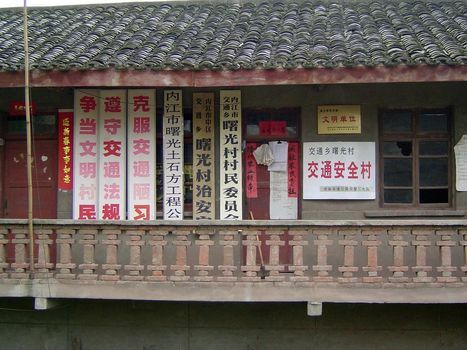 The white banners say: "Strive to be a Civilized Villager"; "Follow Traffic Regulations"; "Avoid Bad Traffic Habits," and "Nei-Jiang City Shu-Guang Rock Quarry Engineering Company." 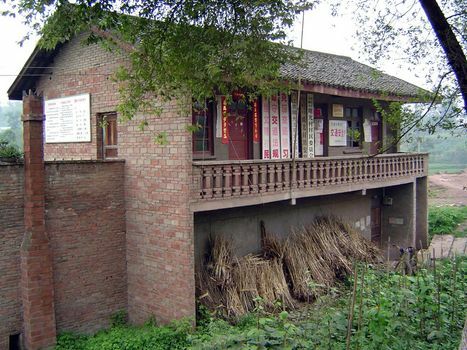 The fixed signs to the right of the door say "Public Safety Department, Shu-Guang Village, Jiao-Tong Xiang, Nei-Jiang City" and "Citizen Group Committee, Shu-Guang Village, Jiao-Tong Xiang, Nei-Jiang City." 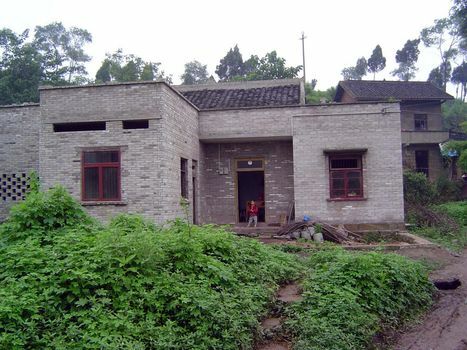 The village houses are not as clustered as you might expect. May as well follow the path. 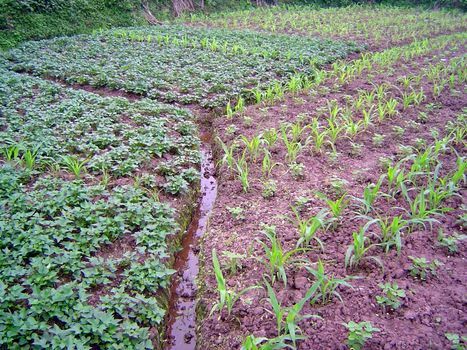 Irrigation channel with sweet potatoes on the left and corn on the right, interplanted perhaps with peanuts. 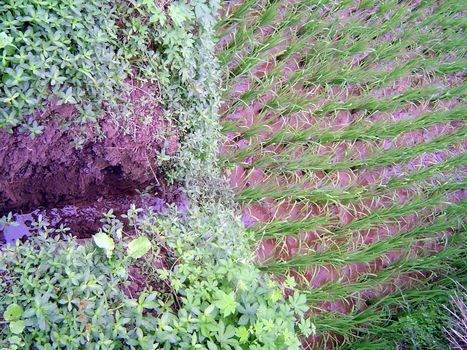 The channel runs off the edge of one terrace and into a rice paddy. The same paddy, stretching to lower terraces. 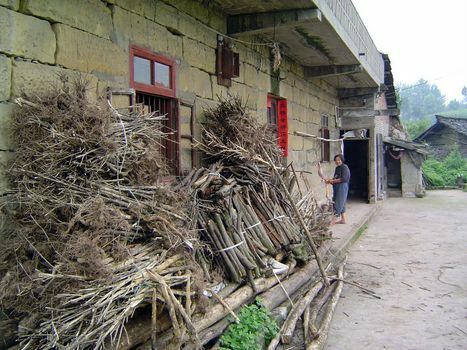 Sichuan was historically China's biggest rice producer. 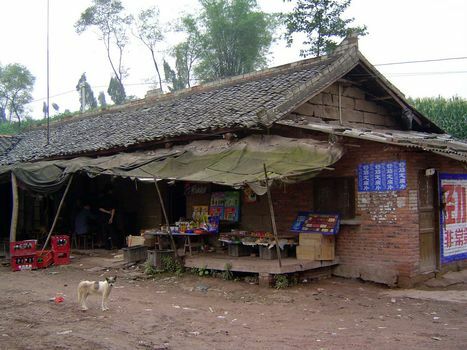 It no longer has that ranking, not since it slipped behind Hunan in 1970 and Jiangsu in the late 1990s. 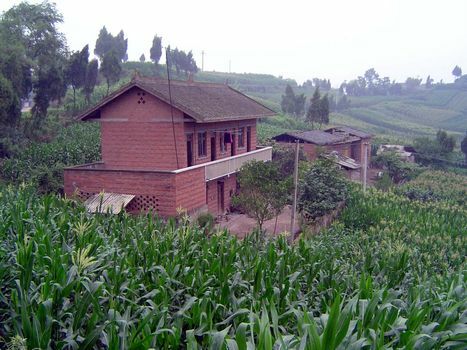 Still, this may not be bad news: rice production in Sichuan fell from a 1990 peak of 21 million tons of rough rice to about 16 million tons a decade later because farmers found that other crops were more profitable. 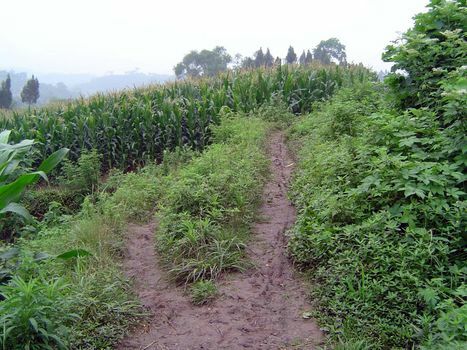 The land planted to rice has declined much more dramatically, from 3.1 million hectares in 1990 to 2.1 million in 2000. 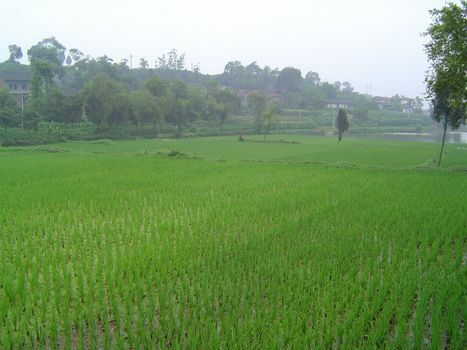 Necessarily, rice yields have risen, from 4.5 tons per hectare in 1970 to 7.7 tons per hectare in 2000. 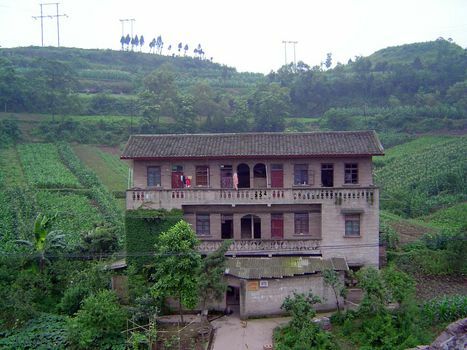 (This change is about the same for China as a whole, although yields in Sichuan have consistently been slightly higher than the national average.) 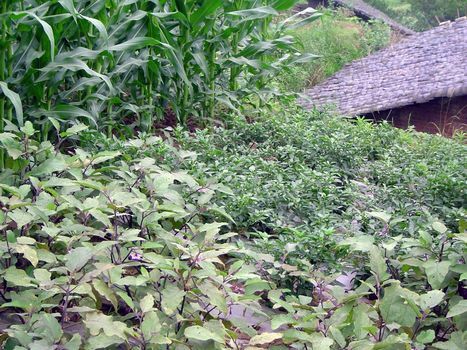 Much of the change can be explained by the adoption of hybrid varieties, which were introduced in the 1970s and now account for 90% of Sichuan's crop. 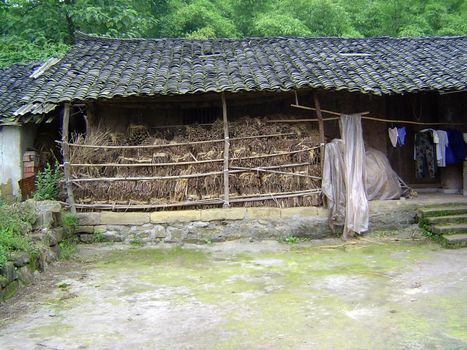 Every house has its fuel bundles. 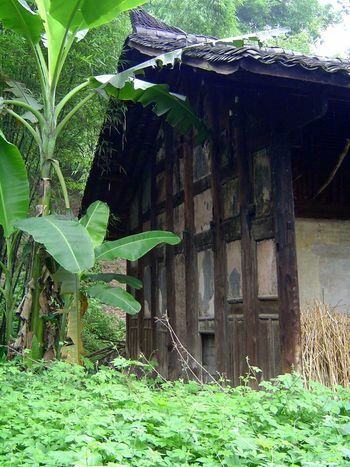 A banana plant next to the massive framing of an old house. 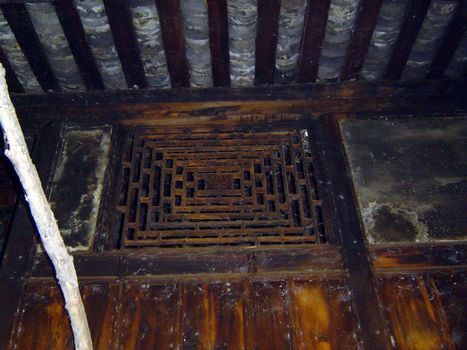 Construction detail, with metal grate. 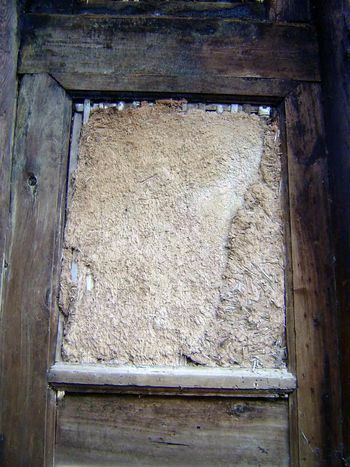 With the conversion of a house to a barn, a screen is plastered over. 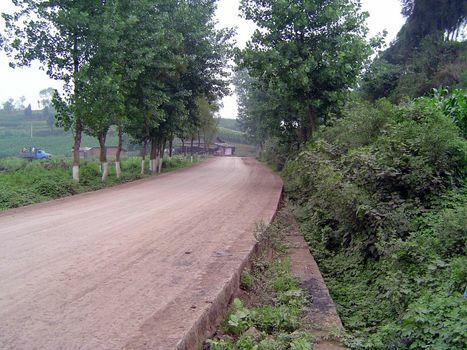 The road back to town. 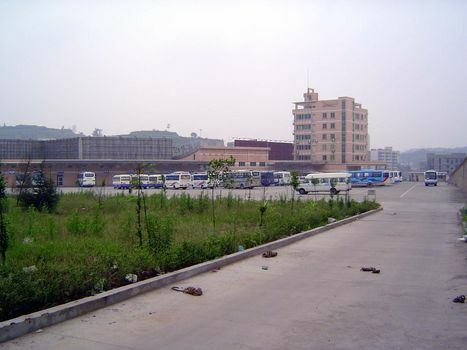 The city bus terminal, with buses from local villages like Shu-Guang.